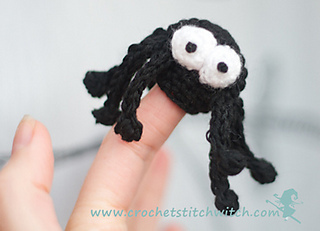 Here’s a little spider finger puppet to crochet using scraps of yarn and a hook to match (I used a 2.5mm hook and double knitting). It might take a bit of experimenting to find the right hook and yarn combination to fit whatever size finger you are making it for! You won’t need any stuffing just a hook, yarn, scissors and needle.